Some Nigerian federal lawmakers are demanding bribes as conditions for passing the 2018 budgets of federal Ministries, Departments and Agencies (MDAs), some heads of these agencies have said. 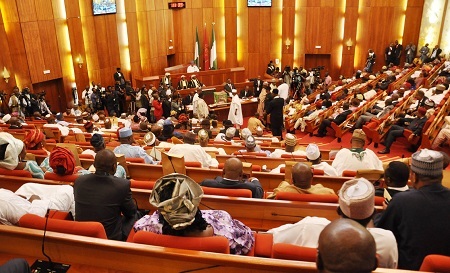 The officials say the unceasing demand for gratification is responsible for the reluctance of a number of heads of MDAs to honour invitations by Senate and House of Reps committees to defend their budgets. Four officials of notable MDAs, who spoke to Premium Times in separate interviews alleged that the senators and members of the House are desperate and bent on shaking them down because ”the 2018 budget is the last they would consider before the next general elections”. However, three weeks after the ultimatum was issued, majority of the MDAs are yet to comply, PT learnt. The head of a key agency, who spoke with PT but does not want his name mentioned for fear of victimisation, said: “I can confirm to you that National Assembly members are brazenly harassing MDAs for bribes, using budget process and oversight.